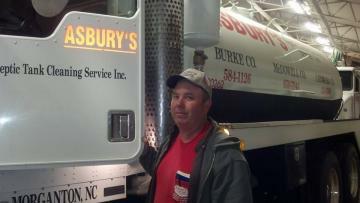 About Us | Asbury's Septic Tank Cleaning & Backhoe Service Inc.
#1 in the "#2" Business Since 1995! Locally owned and operated by Jay Asbury since 1995, Asbury's Septic Tank Cleaning & Backhoe Service Inc. in Morganton, NC has provided residential and commercial customers with dependable septic services, backhoe services and porta john rental services. We pride ourselves on our prompt response and professional workmanship while out on the job, giving our customers peace of mind. Voted Best of Burke for 5 years in a row, it's obvious that we've made a positive impact in our community. Available 24/7, fill out the form below to schedule your service or call if it's an emergency. We serve customers in Burke County, NC, Catawba County, NC, McDowell County, NC and beyond! Count on Asbury's Septic Tank Cleaning & Backhoe Service Inc. for all of your septic tank, backhoe and porta john needs! Call Today for Your Service! Voted Best of Burke 5 Years in a Row!